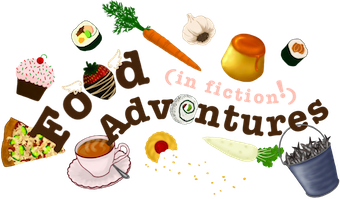 Book Adventures: The Candy Shop War Card Game, Help Out via Kickstarter! The Candy Shop War Card Game, Help Out via Kickstarter! 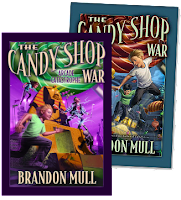 A Kickstarter campaign is going on right now to raise funds for production of The Candy Shop War card game based on Brandon Mull's Candy Shop War books! 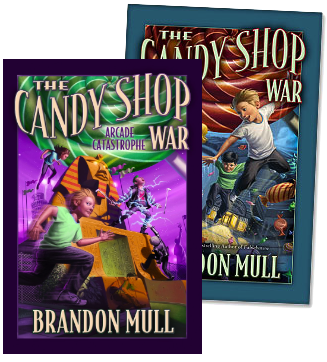 Book one, The Candy Shop War was released in 2007 and book two, The Arcade Catastrophe, came out Oct. 2012. And first editions of book two contain a starter set of cards! The artwork for the card game is by series illustrator Brandon Dorman who also did the artwork for Brandon's bestselling Fablehaven series. The game itself was designed by August Larson who lives in Orem, UT. As a backer for the project, you can score autographed copies of The Candy Shop War books as well as the card game itself! Check out the videos below to learn more about the Kickstarter campaign and gameplay. 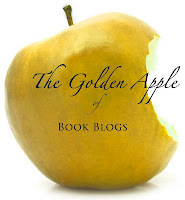 And check it out! There's even a FREE two-person Candy Shop War game app available for the iPad! 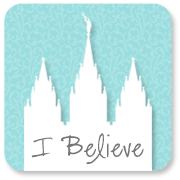 Visit the app site here & download the game for free from iTunes here. ((For some reason the website hasn't been updated to include the download link--but it is available as of Jan. 31st!)) I'll do another post about the app in the near future. Very good book.It is cool when they get the candy and one type of candy is called moon rocks.